Dinefwr Castle stands on a ridge on the north bank of the River Towy in Carmarthenshire, Wales. Dinefwr was the chief seat of the Principality of Deheubarth. | It is said that the first castle on this site was built by Rhodri the Great, and the castle later became the chief seat of Hywel Dda, first ruler of Deheubarth and later â€œking of the Britonsâ€ and king of most of Wales. Rhys ap Gruffydd (The Lord Rhys) ruler of Deheubarth from 1155 to 1197 is thought to have rebuilt the castle, along with the spectacular castle at Carreg Cennen, just four miles away to the south. | â€œOn Rhys ap Gruffydd's death the castle passed to his son Rhys Gryg, and the earliest parts of the present castle are thought to derive from this period. Llywelyn the Great of Gwynedd was now extending his influence to this area, and Rhys, finding himself unable to resist, dismantled the castle. Llywelyn however had it restored and held it until his death in 1240. In 1255 Llywelyn the Last gave Dinefwr to Rhys Fychan, then later gave it to Maredudd ap Rhys before later returning it to Rhys Fychan. Maredydd now allied himself to King Edward I of England, and helped Edward capture Dinefwr in 1277. Maredudd had apparently been promised Dinefwr in return for his help, but Edward did not keep his promise and had Maredudd executed in 1291.The castle now came into English hands, though it is recorded to have been burnt during the rebellion of Llywelyn Bren in 1316. In 1317 it was given to Hugh Despenser, the king's favourite.| It was unsuccessfully besieged by the forces of Owain GlyndÅµr in 1403. Towards the end of the 15th century the castle was held by Sir Rhys ap Thomas, who carried out extensive rebuilding. In 1531 his grandson was executed for treason and the castle was confiscated by the crown, though the family were later able to recover it. Around 1600 Newton House was built nearby and the castle keep modified as a summer house. The remains of the large windows can be seen at the top of the keep, but it burned down in the 18th century. The castle is now owned by the Wildlife Trust of South and West Wales and managed by CADW on their behalf.â€ | The castle stands within Dinefwr Park, which is owned by the National Trust. Access to the castle is free to walkers from Llandeilo town nearby, and there is a small free car park near the castle, but it can only be reached by a rough track through the deer park. 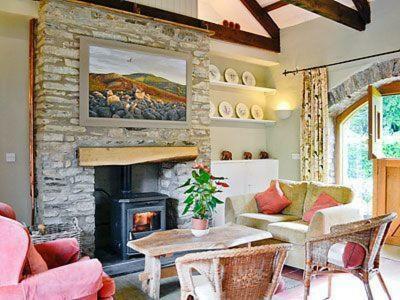 Walesdirectory.co.uk, where you can find where to go, what to see, and where to stay in Llandeilo Wales.